Grades, grades, grades... Currently there's a discussion on 8a.nu regarding the original grade of Action Directe, when it became 9a and who declared this first. Well... if I'm not totally wrong here, I believe Wolfgang Güllich sort of shied away from giving it a French grade at all, opting for the UIAA grade XI instead. The reason for this, we'll probably never know, but given the fact that there, at the time, only existed one 8c+ and a handfull of 8c's in the world, and that the hardest WoGü himself had climbed was 8c, I'm guessing the concept of levels above 8c+ was at best shady... I'm sure WoGü realized AD was probably a new standard, but what that meant in terms of a grade... 8c+? 9a? 9a+? How hard is hard? Regarding the Who said what first?-thing, the 9a speculation was there from the start, this much I know. But if it was regarded as 9a by the top dogs at the time is a completely different story. Probably no, I'd say. 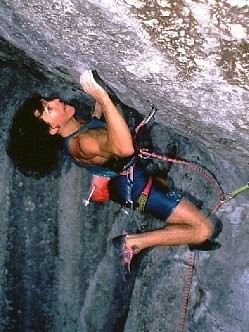 Alexander Adler made the 2nd ascent back in 1995, but he really lacked the experience to say much about the grade. So, really, it wasn't until the 3rd and 4th ascent (Iker Pou and Dave Graham) in 2000 and 2001, that the grade settled at 9a. In this sense, Jens is correct in saying 8a.nu was one of the first to declare Action Directe 9a. Saying this with any kind of certainty before this time would have been impossible, as it would have been a speculation. Photo: Wolfgang Gullich on the first ascent of Action Directe. Courtesy of Thomas Ballenberger.